Walsh. John Henry - In fine original condition. uniting A GOOD STYLE WITH ECONOMY, and ADAPTED TO ALL PERSONS IN ANY CLIME; containing MANY UNPUBLISHED RECEIPTS IN USE BY PRIVATE FAMILIES. COLLECTED BY A COMMITTEE OF LADIES. and edited by J.H. WALSH F.R.C.S., author of 'A Manual of Domestic Economy' With Engravings. LONDON; G. ROTALEDGE AND CO. FARRINGDON STREE; AND 18 BEEKMAN STREET, NEW YORK. 1859. FIRST EDITION. 8vo. 1fep. 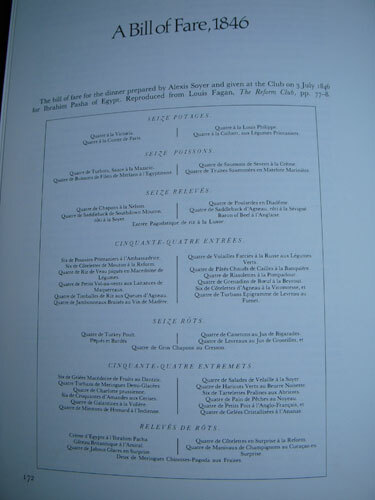 Frontispiece of kitchen ranges. Title page. (1)iv Preface. (1)vi-viii Contents. (1)2-350. 351-360 Bills of Fare. (1)362-375 Index. 1fep. With eight wood engraved plates (including the Frontis) Publisher's quarter red morocco and green cloth, gilt stamped on the spine and front cover. Housed in modern quarter dark tan and marbled boards slip-case, with gilt lines and tooling and gilt lettering. Internally very clean and tight with sometime past strengthening of the inside guttering. An extremely nice copy in this condition. - Cagle, on pp 752, records an edition of 1858, unrecorded in other bibliographies. This edition of 1859 is a first also. Whether it is a 1st or 2nd issue is difficult to ascertain. The Preface is dated September 1858. Lacking any further information in the book or in Bitting or Axford, one might assume this is a first edition - 2nd issue. The spine and boards are in exceptional condition. The spine is filled with the original beautiful bright gilt figures and lettering. A large bright gilt ornament of the quality is on the front cover. They are as good as new, thus the reason for the slip case. Walton. Izaak - A miniature with original binding. OR THE Contemplative Man's Recreation BEING A DISCOURSE OF RIVERS, FISH-PONDS, FISH AND FISHING WRITTEN BY IZAAK WALTON LONDON: HENRY FROWDE OXFORD UNIVERSITY PRESS WAREHOUSE AMEN CORNER, E.C. 64mo. 2,1/16" x 1,3/4". (48 x 55mm) 1fep. Half title. Frontispiece of Walton. 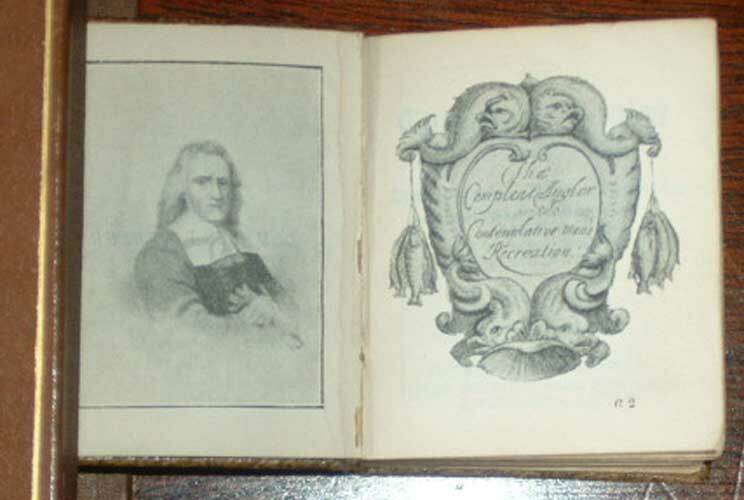 Decorative Title Page with the words "The Complete Angler or the Contemplative Men's Recreation" Title Page. vii-xii Epistle Dedicatory. xiii-xix+(1)1-588. (Strangely the pagination has the page numbering starting in the middle of the dedication to the Reader). 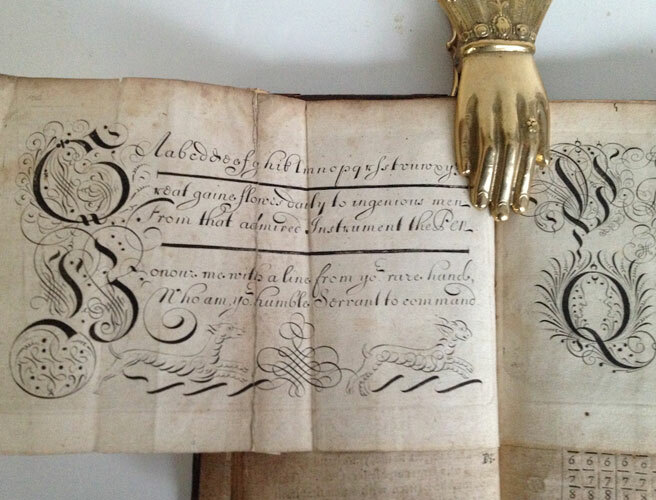 Has little engravings of fish in the text. Bound in the publishers original clean full limp dark fawn crushed morocco with gilt lettering on spine and front cover. All housed in a full brown calf clam-shell box with gilt lines on the boards. Spine has raised bands with gilt lines and green and red labels with gilt lettering. Inside the clam-shell box is lined with red felt. Internally the book is very clean. A handsome little item. Extremely scarce. - An Oxford University Press, Miniature Edition. There is no date, but on the verso of the decorative title, it states: from "the fifth edition, much corrected and enlarged". The fifth edition, published in 1676, was the last which Walton himself corrected. This little volume was probably published - circa 1900. 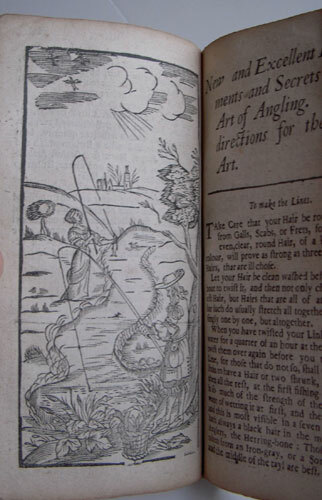 Walton’s famous treatise on fishing was printed five times in the seventeenth century. It was first published in May of 1653 with an engraved title-page and engravings of six fishes in the text. The second edition of 1655 contains many alterations and additions to the text, the number of pages being increased from 246 to 355, and the number of chapters from 13 to 21. Seven commendatory poems were prefixed. Four engravings of fishes were added. The third edition was printed in 1661 and re-issued in 1664, with a new title-page. A commendatory poem by Brome previously printed is omitted, and there are a few alterations in the text. The most significant additions are the "Postscript touching the Lawes of Angling" and the Index. The fourth edition was printed in 1668 and closely followed the third in content. The fifth edition, printed in 1676, introduced further changes. The text was revised and considerable additions were made, the length of the text being increased by 20 pages. The copper-plates were re-engraved. 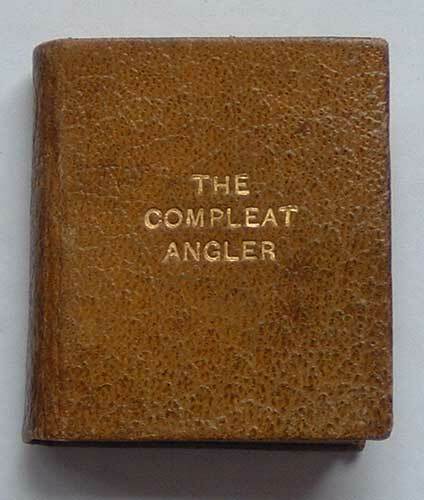 Altogether, 'The Compleat Angler' was reprinted 10 times in the eighteenth century, about 117 times in the nineteenth century, and between 30 and 40 times in the twentieth century. 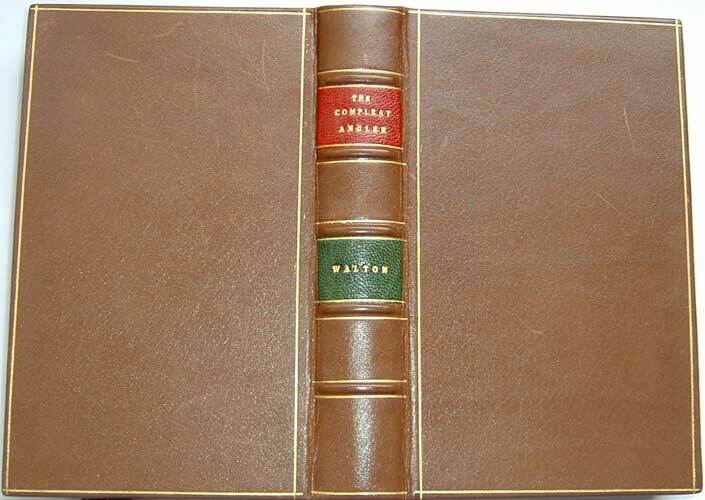 Of a single edition published by Cassell & Co. in 1886, 80,000 copies had been sold by 1914. The text of the fifth edition, 1676, has usually been followed in the subsequent printings. A hugely successful book over the centuries that has few rivals. Warner. Richard - With a signed hand written letter from Richard Warner . 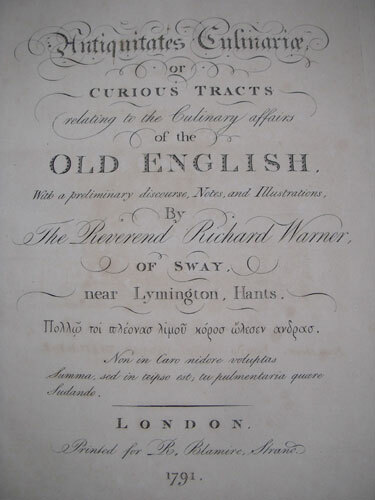 or Curious Tracts relating to the Culinary affairs of the Old English, With a preliminary discourse, Notes, and Illustrations, By The Reverend Richard Warner, of Sway, near Lymington, Hants. 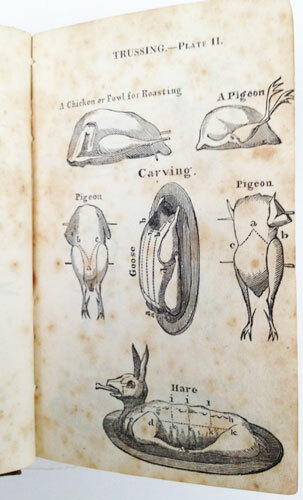 Printed for R. Blamire Strand, London, 1791. 'FIRST & SOLE EDITION. Large 4to. 4feps. 1 Double page aquatint plate of the famous 'Peacok Feast. Engraved title-page. Single page aquatint plate of 'A Saxon Entertainment' (1)ii-lvii Preliminary Discourse. (1)-l The Contents. 2-137. 3feps. The Title Page has some foxing and the the double engraved plate is very slightly age browned otherwise a very clean and very well-preserved wide-margined large paper copy. Also enclosed is a 3 page, 185x222mm signed handwritten letter in good condition from Richard Warner to David Read, discussing and listing a number of his religious publications. Dark brown calf boards rubbed but with a nice patina, with original dark brown morocco spine with bright gilt lettering. With the bookplate of John Marks on the front pastedown. A rare collector's item, especially with the Warner letter. - Richard Warner (1763-1857) was a prominent English antiquarian and divine. 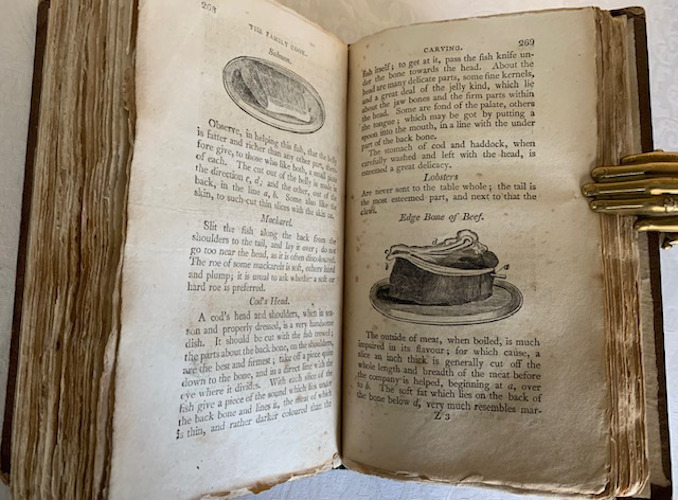 His ‘Antiquitates Culinariae’ was one of the first works to examine the history of early English cookery, at the forefront of a scholarly movement that developed over the last three decades of the eighteenth century. 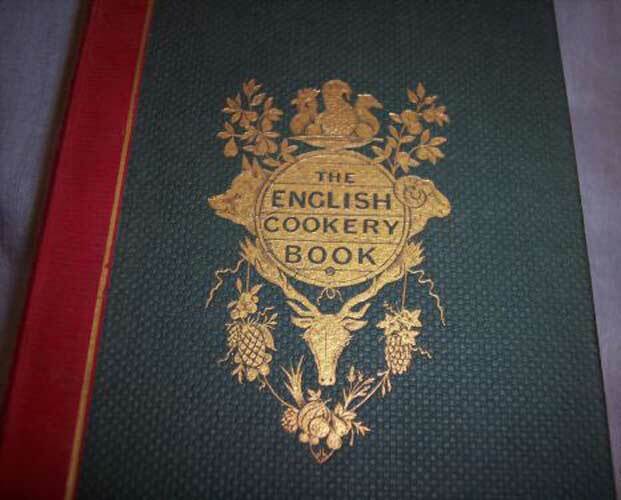 The book contains Warner's detailed introductory notes, then 'The Forme of Cury', copied from an ancient vellum roll thought to have been compiled about 1390 by the master cooks of King Richard II. 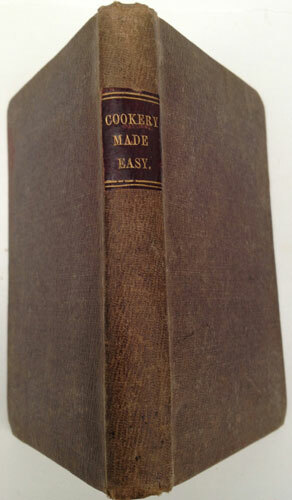 It further contains 'Ancient Cookery, A.D. 1381', which is another collection of recipes from the same vellum roll. 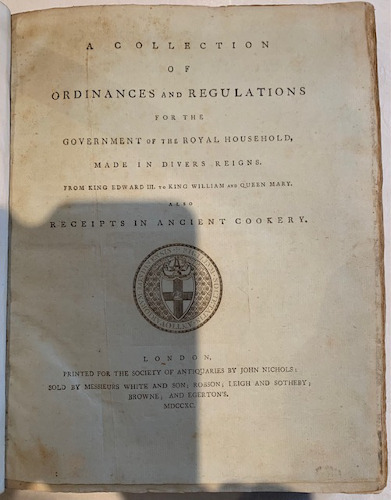 Also 'Ancient Cookery', a collection of recipes from a fifteenth-century manuscript but which dates from a much earlier period, plus 'Ancient Recepts to Preserve Fruits' from the mid-seventeenth century. An account of the enthronization feast of George Neville as Archbishop of York in the reign of King Edward IV, and an account of the enthronization feast of William Warham as Archbishop of Canterbury in 1504, are also recorded. The double-page colored plate titled "A Peacock Feast," which is present in this volume, was removed from most copies, owing to a dispute with the original publisher. Cagle notes this title was printed on both large and smaller paper. This copy is one of the large paper issues. Bitting, p. 485; Cagle, 1049; Crahan sale 446; Simon 1607. Warner. Richard - With a signed hand written letter from Warner. FIRST & SOLE EDITION. Large 4to. 1feps with a tipped in hand written letter from Richard Warner. 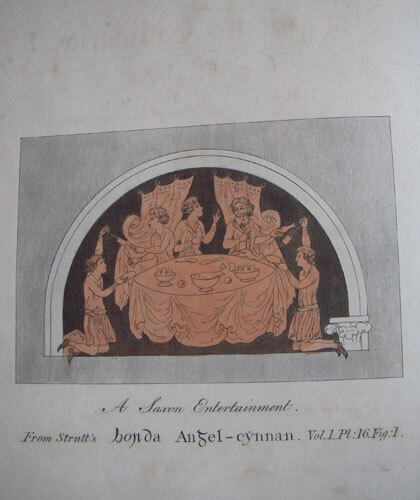 Frontispiece - an aquatint plate of 'A Saxon Entertainment' Engraved title-page. 1 double-paged aquatint plate of the famous 'Peacock Feast'. (1)ii-lvii Preliminary Discourse. (1)-l The Contents. 2-137. 1fep. Occasional very minor spotting, else a very well-preserved wide-margined large paper copy. 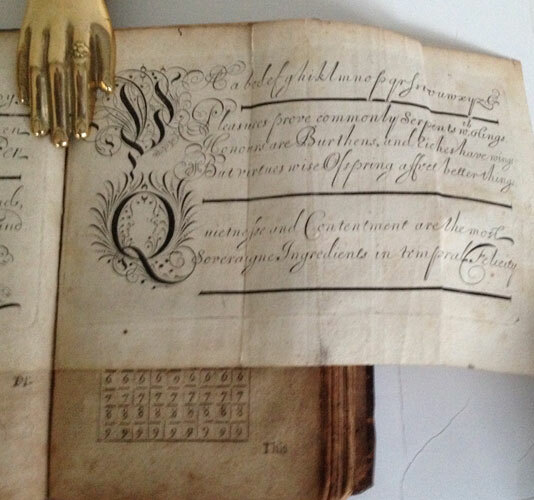 Rare original cloth boards and leather spine with gilt lettering. Both ends of the spine slightly rubbed and a crack on one side but still solid. The tipped in 1p hand written letter from the Rev.Richard Warner to 'Mr Dear Sir' asking for a facsimile "of the words per me Ric. Abbem at the foot of the acknowledgement of supremecy of Hen: VIII." 110x160mm with very minor blemishes just above the signature. Dated 14th August 1825 - Weston super Mare, Somerset. 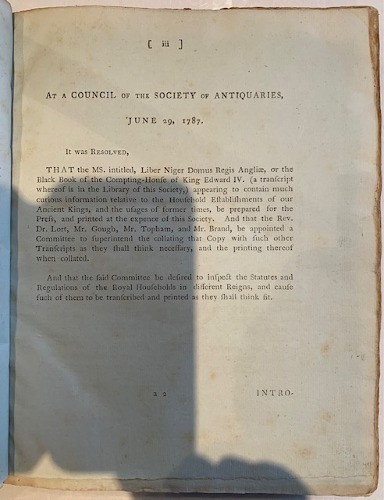 - Richard Warner (1763–1857), divine and antiquary, born in Marylebone, London, on 18 Oct. 1763, was the son of Richard Warner, ‘a respectable London tradesman.’ Early in his sixth year he was sent to a boarding-school near London, and remained there until his father removed, with his family, to Lymington in Hampshire, described by him in his ‘Literary Recollections’. On 19 Oct. 1787 he matriculated from St. Mary Hall, Oxford, and kept eight terms at the university, but left without taking a degree. About 1790 Warner was ordained by William Markham, archbishop of York, his title being the curacy of Wales, near Rotherham, where he stayed for three months, the curacy of his vicarage of Boldre, near Lymington for nearly four years. The influence of Gilpin's tastes was afterwards perceptible in the topographical writings of Warner. Then the more lucrative curacy of Fawle for over two years; but the situation did not agree with his family. The chapel of All Saints, Bath, in the parish of Walcot, was opened for divine service on 26 Oct. 1794, and Warner was placed in charge of it as curate to John Sibley, rector of the mother parish. In April 1795 he accepted the curacy of the populous parish of St. James's, Bath, and he continued in that position for about twenty-two years, preaching his farewell sermon on 23 March 1817. For many years after his settlement at Bath, Warner was the best-known man of letters in that city, and he knew all the literary men who frequented it. Warner was appointed on 13 May 1809 to the rectory of Great Chalfield in Wiltshire, which he enjoyed until his death. In the 1826 list of fellows of the Society of Antiquaries his name appears as elected, but he was never admitted. He died on 27 July 1857, when nearly ninety-four years of age, and was buried on 11 Aug. 1857 in the chancel of Chelwood church, a monument being erected to his memory. The widow, Anne [‘Pearson’], died at Widcombe Cottage, Bath, on 23 March 1865, aged 85, and was buried at Chelwood. One daughter, Ellen Rebecca Warner, was also buried there on 18 Sept. 1833. Warner's voluminous writings comprised over 44 various volumes. Given this huge output, one wonders if the people of his many parishes knew what he looked like. 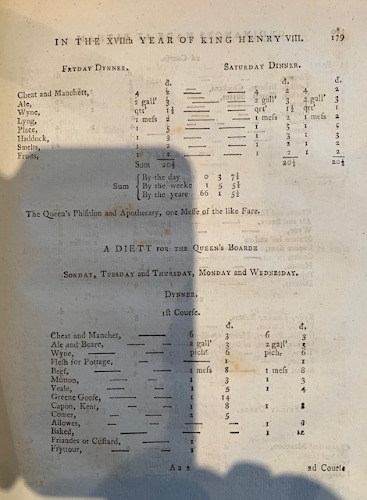 This, his infamous book, ‘Antiquitates Culinariæ: Tracts on Culinary Affairs of the Old English,’ 1791 attracted the attention and ire of John Carter (1748–1817) who prosecuted him for pirating in this work his print of the ‘Peacock Feast,’ and got a verdict for 20l guineas. The print was therefore torn from all the copies then unsold. This action cost Warner 70l guineas in all. Interestingly, Warner had been told that Carter had given permission for the reproduction. This fine original copy has survived with the ‘Peacock Feast’ plate intact. Large 4to. 1923. 7th Edition. Pastedown and endpaper with special printer's design. Half title. Book title in German, English, Swedish, French and Spanish. B/W Photograph of Erich Weber. Title Page. 2p Preface in five languages. 2p Index. 1-108. Recipes in 5 languages on verso with a photograph on the facing page. 2p Advertisements. End-paper and paste-down with special printer's design. With 90 coloured & 186 b/w plates. Also with 23 stencils of cakes & 6 celluloid schablones. Plus a 4to soft paper Recipe book with 37 pages. D/W in good condition with some pieces missing with no loss. Very fresh red cloth boards and spine with gilt writing and device on the boards. - At the end of the 20th century, Germany started to rise to prominence in the confectionary crafts. Urbain Dubois (a Frenchman) had recently been appointed the Royal Confectioner to the court of Kaiser Willhelm 1. By the 1890’s Germany was wrestling with France to become the arbiter of confectionary design. Johannes Martin Erich Weber’s books started to make an impact. Weber was a Dresden supplier and confectionary school owner, who brought to his manual new recent technical advances in photography and printing. He also had an imaginative approach to marketing. Praktische Konditorei-Kunst was a popular guide for pastry students and chefs who baked goods for the Konditorei, those tearooms and cafés specializing in the pastry arts. Part of the importance of this book lies in its set of cake decoration templates and perforated parchment guides. The original supplements rarely withstood decades of use in professional kitchens. This copy has all of them present. The book and the two supplements are housed in their original thick brown cardboard sleeve, albeit - quite rubbed. The original dust-jacket is present (see 1st photograph below) and the book is in excellent condition overall. A wonderful item that is the legacy of a proud craftsman. It is a testament to the highest standards of bakery, patisserie and cake decoration, etc, of that time. Willis. Michael - Extremely scarce first edition. FIRST EDITION. 164 X 100mm. 1fep. 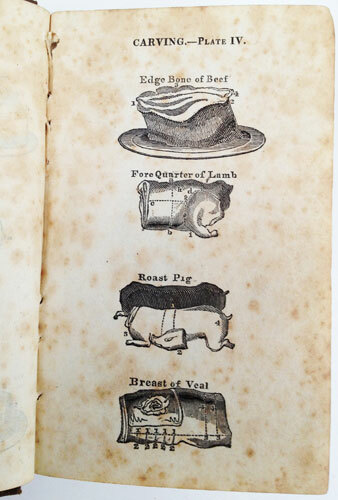 Unusual Frontispiece of two meat suppliers. Title page. (1)iv-vi Preface. (1)viii-xvi Contents. 5p Plates of Trussing and Carving. (1)2-205. 206-213 Bills of Fare. p214-216 Marketing Tables. 2feps. Frontis evenly foxed. Some age browning and light sporadic foxing throughout. 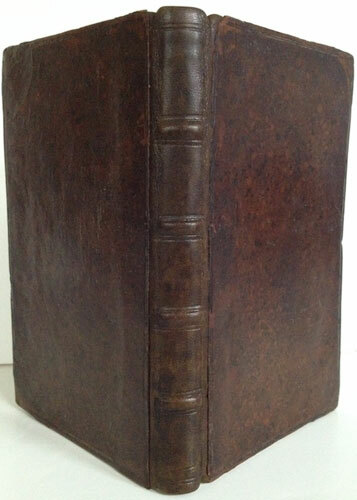 Original slightly faded grey cloth covers with a dark leather and gilt label on spine. - At Willis's place of employment during the London season on Sunday evenings, the Thatched House Tavern on St. James St. hosted the dinners of the Dilettanti Society. Portraits of the members, many of them painted by Sir Joshua Reynolds, adorned the walls of a room devoted exclusively to their use. The society met originally at Parsloe's in St. James's St., but moved to the Thatched House Tavern in 1799. Many other art societies and associations, as well as the Royal Navy club used the large and elegant rooms of the Tavern. St. James Street dates to 1670 and runs northward from St James Palace. The poets Waller and Pope lived there, Wren till he died in 1723, Gibbon the historian till 1794 and Lord Byron lodged at #8, in 1811. The tavern was also the favourite haunt of Swift. At the south-west end of the street next to the Palace was the St James Coffee Hse, but taken down in 1806. From early times the street found favour with the London literary scene, which in turn was favourable to the growth of well appointed taverns and clubs. The Thatched House was pulled down in 1863. It was nearly the last remaining relic of old St James St. On part of its site the Civil Service club was erected. Michael Willis the cook and author, appears to be a very confident man, especially about his book. In the last lines of the preface he proclaims: “The object of the writer has been to furnish a valuable and useful book at a low price; and the approbation of the public is his highest ambition. 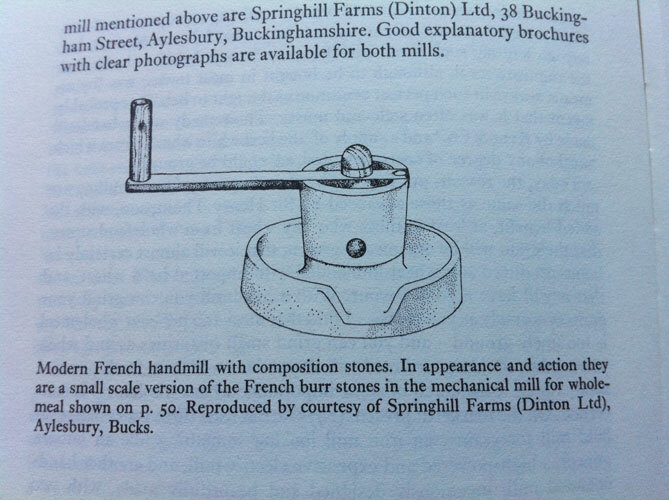 It contains twice as much as any similar works hitherto published at Four Pounds the Price! and he has no hesitation in asserting, that it is surpassed by none, either in quantity, quality, or variety”. It is a interesting book with some nice detail in the recipes, as expected of a professional cook. 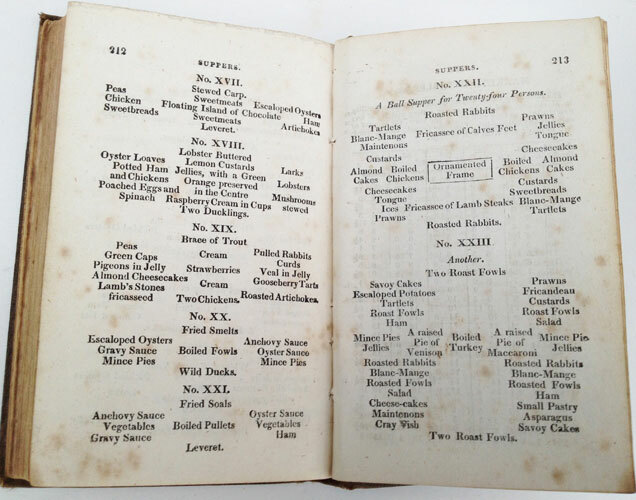 Also interesting as a culinary record of a famous and high class Tavern. 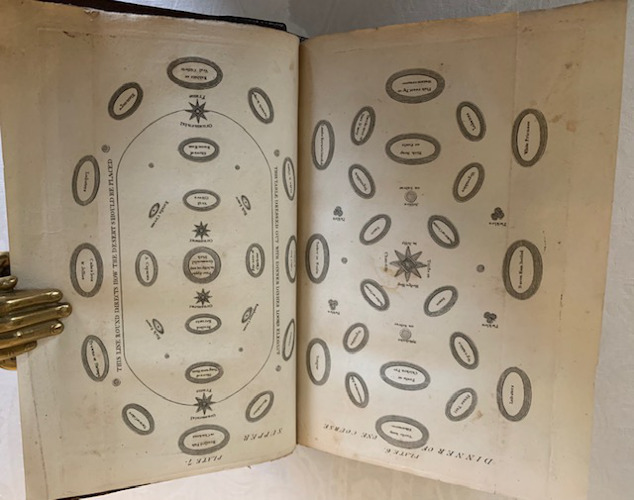 The book has been produced in a modern facsimile, so it has had a modern impact that could never have been foreseen nor dreamed of by Willis two centuries ago. 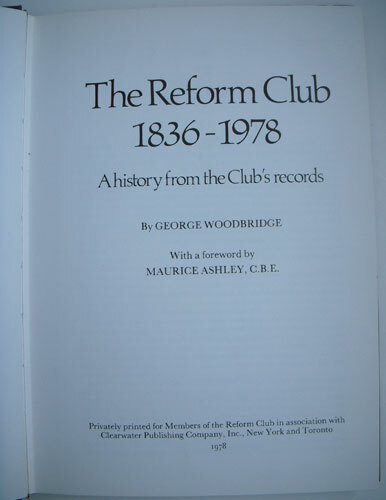 1836-1978 A history from the Club's records by GEORGE WOODBRIDGE With a foreward by MAURICE ASHLEY, C.B.E. Privately printed for Members of the Reform Club in association with Clearwater Publishing Company, Inc., New York and Toronto 1978. FIRST EDITION. 1978. 250x180mm. 1fep. Half title. 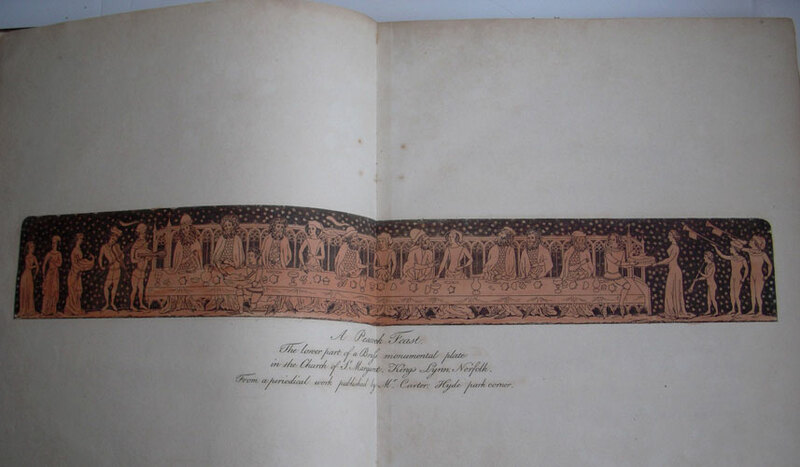 Verso with frontispiece - lithograph of London Clubs incl. The Reform. Title page. Verso with ISBN. 2p Forward. 2p Preface and Acknowledgements. 2p Contents and Illustrations. 1-173. 175-178 Bibliography. 179-185 Index. 1fep. 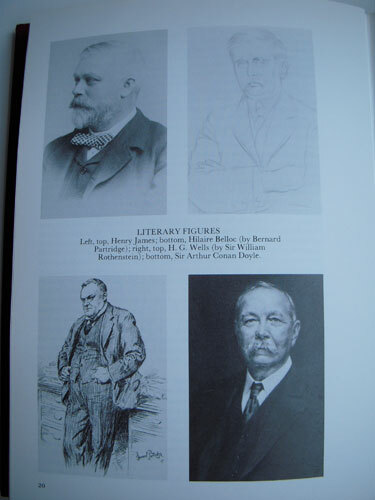 With numerous photographs and illustrations in-text, some full page. Fully bound navy blue cloth and gilt writing and tooling on the spine and front cover. With a wine red d/j. All in excellent condition; as new. - The Reform Club is a gentlemen's club on the south side of Pall Mall (at number 104), in central London. Originally for men only, it has admitted women since 1981. In 1977 its subscription fees were among the highest in London. It was founded in 1836 by Edward Ellice, Whig whip, whose riches came from the bank 'The Hudson's Bay Company', but whose zeal was chiefly devoted to securing the passage of the Reform Act of 1832. The new club, for members of both Houses of Parliament, was meant to be a centre for the radical ideas which that bill represented; a bastion of liberal and progressive thought that became closely associated with the Liberal Party, which had largely succeeded the Whigs by the middle of the 19th century. Until the decline of the Liberal Party, it was de rigueur for Liberal MPs to be members of the Reform Club, which almost constituted another party headquarters, although the National Liberal Club, formed under William Gladstone's chairmanship, was established in 1882, designed to be more "inclusive", and was geared more towards Liberal grandees and activists in the country. The building, like its neighbor the Travellers Club, (number 106), was designed by Sir Charles Barry and opened in 1841. 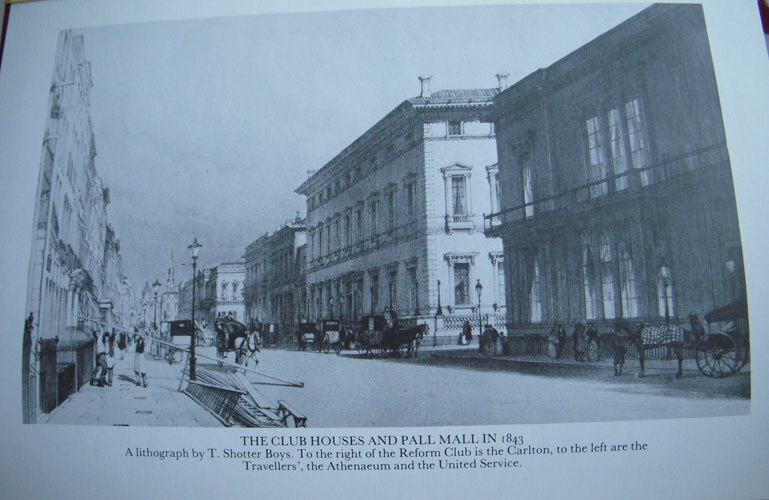 The new club was palatial, the design being based on the Farnese Palace in Rome. The Reform was one of the first clubs to have bedrooms, and its library contains some 75,000 books, mostly political history and biography. The Library was established in 1841, shortly after the Club moved into the newly built clubhouse. 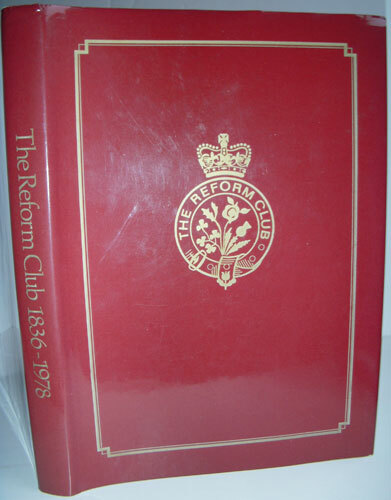 A comprehensive collection of parliamentary papers, reports, speeches and reference works was regarded as essential for the many active politicians amongst the early members. But the Library also aimed to achieve a broad coverage in the humanities, in order to serve the Club's more general cultural aims. The Library was formed under the guidance of Sir Anthony Panizzi, a Club member and also the most distinguished librarian of the age; from 1856 to 1866 Panizzi held the post of Principal Librarian to the British Museum, where he is particularly remembered as the designer of the famous circular Reading Room. Another famous aspect of the Club is its association with Alexis Soyer. 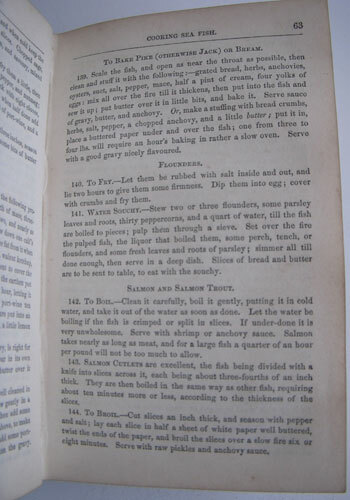 The flamboyant chef, self-promoter and writer of several important cookery books, became Chef de Cuisine in 1837. He designed the kitchens with Charles Barry at the newly built Club. He instituted many innovations, including cooking with gas, refrigerators cooled by cold water, and ovens with adjustable temperatures. His kitchens were so famous that they were opened for conducted tours. When Queen Victoria was crowned on 28 June 1838, he prepared a breakfast for 2,000 people in the Club. His salary was more than £1,000 a year. His eponymous Lamb Cutlets Reform are still on the menu of this grand institution. During the Great Irish Famine in April 1847, he invented the 'magic stove' and designed a soup kitchen. The Government asked him to go to Ireland to implement his idea. He got indefinite leave from the Club and opened his soup kitchen in Dublin and his 'famine soup' was served to thousands of the poor for free. 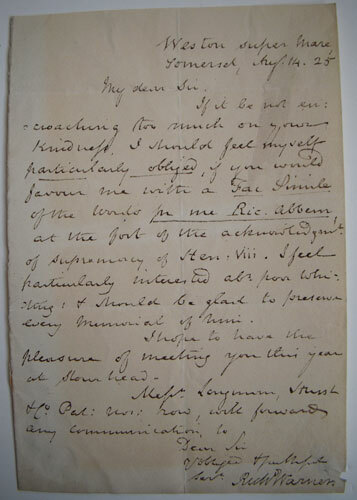 Soyer resigned from the Reform Club in May 1850. He was succeeded by another famous Victorian cookery-book writer; Charles Elme Francatelli, who went on to serve the club with distinction for seven years. This volume is an interesting history of an important London institution and bastion of the more liberal elements of the British establishment. Woodward. S.P. - In fine original condition. 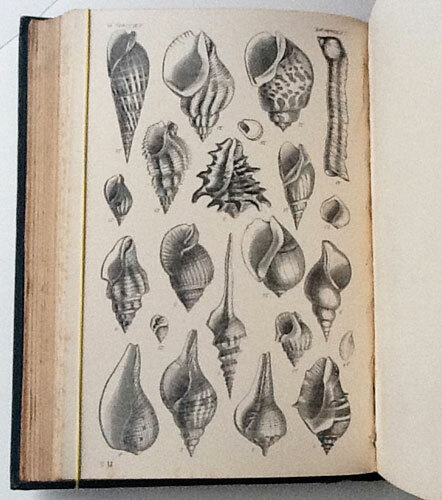 BEING A TREATISE OF RECENT AND FOSSIL SHELLS By S.P. WOODWARD, A.L.S., F.G.S. 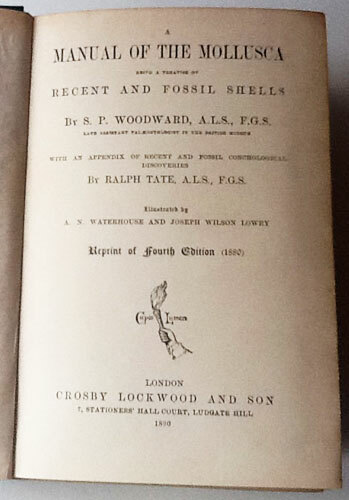 LATE ASSISTANT PALAEONTOLOGIST IN THE BRITISH MUSEUM WITH AN APPENDIX OF RECENT AND FOSSIL CONCHOLOGICAL DISCOVERIES By RALPH TATE, A.L.S., F.G.S. Illustrated by A.N. WATERHOUSE AND JOSEPH WILSON LOWRY Reprint of Fourth Edition (1880). (A printer’s device of a fire torch with words “Capio Lumen). LONDON CROSBY LOCKWOOD AND SON 7, STATIONERS’ HALL COURT, LUDGATE HILL 1890. Thick 8vo. 178x132mm. 1fep. Half Title. 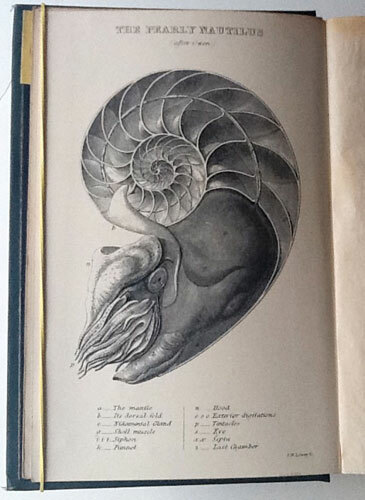 Frontispiece of the Pearly Nautilus. Title Page. (1)vi-viii. (1)x-xvi Contents. (1)2-507. (1)509-518. 1p Index to Figures. 1p Explanation of Plates. 23 Engraved plates of Molusces with all versos blank. 521-542 Explanation of the Plates. (1)Title page - Appendix to the Manual  3-81. 83-85(1) Index to Appendix. (1)2-48 Crosby Lockwood & Son’s Catalogue. (1)2-16 Weales Catalogue. 1fep. Bottle green cloth binding with fine bright gilt tooling on the spine and front board. There is a 50x20mm water stain on the back cover. Besides that, inside and outside in very good condition – as new. - Samuel Pickworth Woodward was born in Norwich on 17 September,1821. He died at Herne Bay, Kent on 11 July 1865. The son of the geologist Samuel Woodward he followed his father's footsteps and also became a famous geologist. S. P. Woodward was sub-curator of the Geological Society of London from 1839–45, then became in 1845 professor of geology and natural history at the Royal Agricultural College, Cirencester. In 1848 to 1865 he was appointed assistant in the department of geology and mineralogy at the British Museum. 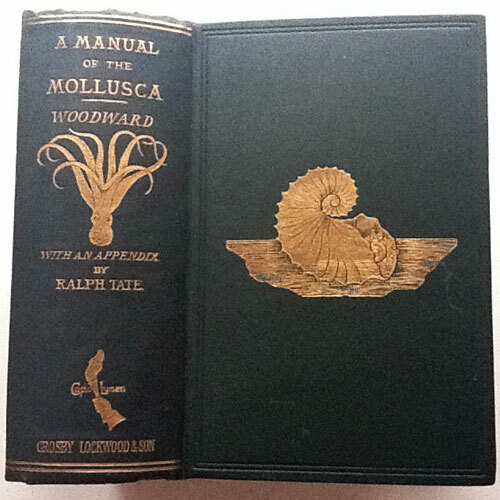 ‘A Manual of Mollusca’, was originally published in three parts - 1851, 1853 and 1856. It is also considered a classical text. It is a very interesting book for such a scholarly work. Did you know that besides a systemic heart Cuttlefish have another 2 bronchial hearts? Once you start reading the myriad features of these shellfish one is completely struck by the fact that they are formed even stranger than they look. It also has a very interesting 270 in-text illustrations with many of the woodcuts being executed by Miss A.N. Waterhouse from original drawings by the author. The twenty-three pages of engravings by Mr Wilson Lowry are amazing in their variety and quantity. There are also 27 additional illustrations in the appendix. 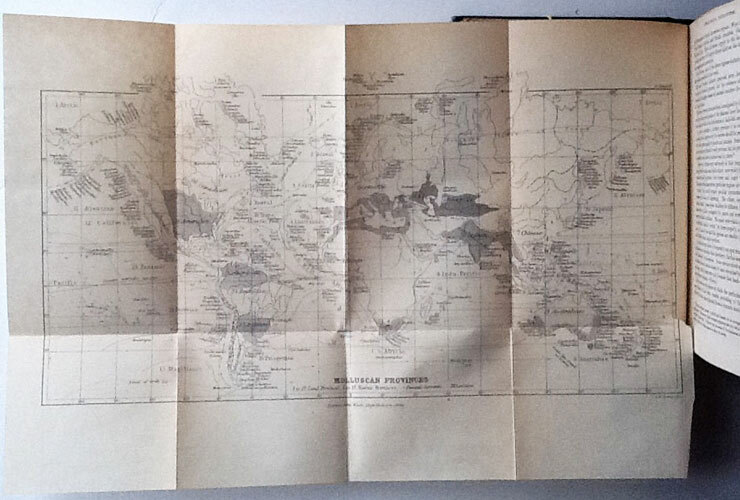 A large folding map is bound in to distinguish the sea provinces of all the various concentrations of mollusca. Very rare in this fine original condition. Woolley. Hannah - The rare first edition. 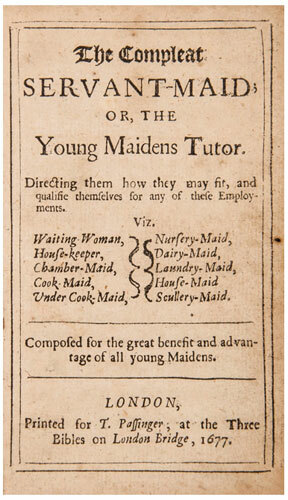 OR, THE Young Maidens Tutor. Diersting how they may fit, and qualifie themselves for any of those Employments. Viz, Waiting Women, House-keeper, Chamber-maid, Cook-Maid, Under Cook-Maid, Nursery-maid, Dairy-Maid, House-Maid, Scullery-Maid. (a single line) Composed for the great benefit and advantage of all young Maidens. (a single line) LONDON, Printed for T. Passinger, at the tree Bibles on London Bridge, 1677. FIRST EDITION. 150x92mm. 1fep with large bookplate of John George Mortlock and Licence information on Verso. Title page has a full double line border. 7 pages The Epistle. 1-167. 3 pages Advertisements. 2feps. 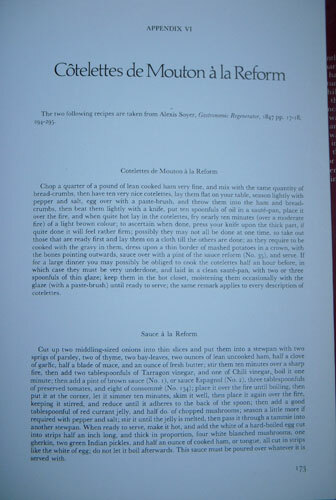 2 folding plates of writing examples, between pages 20-21. 1 plate repaired without loss. Pages 142-154 Bills of Fare. Lightly age-browned throughout. Original dark brown calf boards neatly re-tipped. Modern calf spine sympathetically bound in. - Jilly Lehmann in her very informative book ‘The British Housewife’ has assembled from meagre facts a good dated biography of Hannah Woolley. 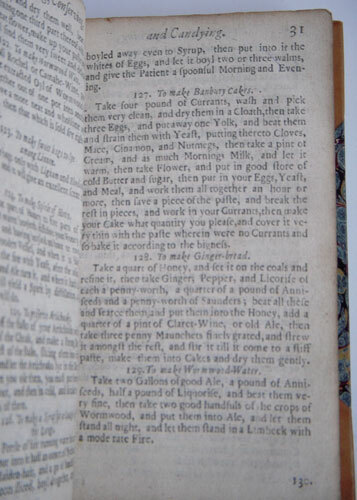 Probably born 1623, she was one of the most prolific Elizabethan cookery writers. 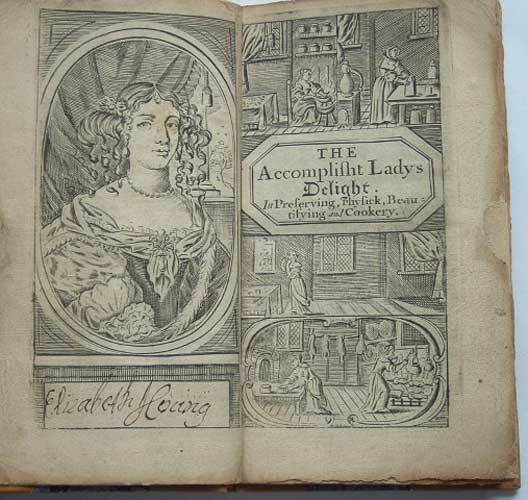 Due to the fact that her works were heavily plagiarised and she produced in total, five cookery books between 1661 and 1677, it made her the dominant figure amongst cookery authors. 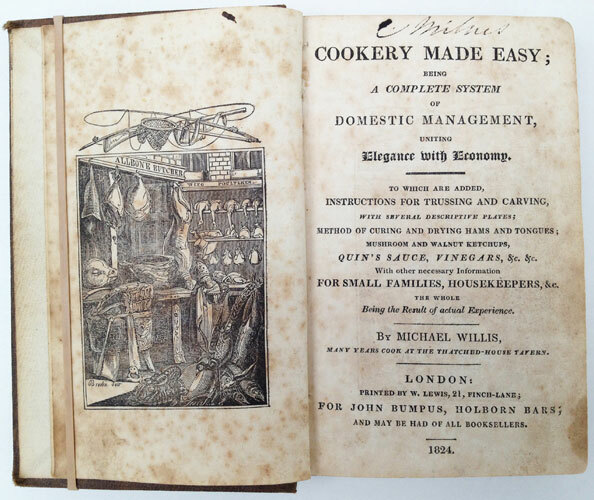 She was also the first to put her name to her works (although this volume remains anonymous) and make a precarious living from writing cookery books. In the supplement of ‘The Queen-like Closet’, Woolley informs us the she learned her cookery skills from her mother and elder sisters. By the age of seventeen she was employed for seven years by a noble lady, who encouraged her by buying her ingredients and books. She then married Woolley in 1647 when she was twenty-four. Woolley was the master of a free school at Newport Pond in Essex. Seven years later they moved and opened another school in Hackney with sixty boarders. Woolley died leaving Hannah with four children to support. She then married Francis Challinor in 1666. 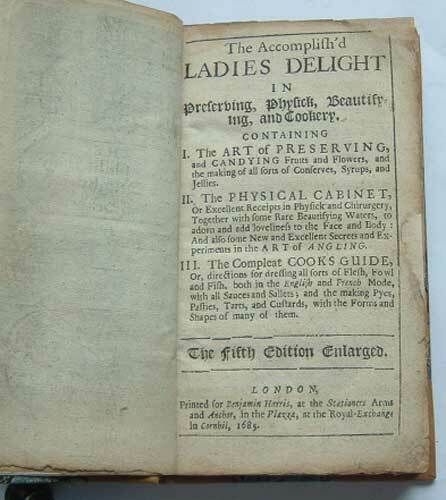 In the early 1660’s she possibly worked for Lady Anne Wroth and her daughter Mary to whom ‘The Cooks Guide’ is dedicated. This last book of Woolley’s is unusual, in that it addresses the complete back-of-house department skills besides just the kitchen. Addressing all the servants, or in Woolley’s words; Young Maidens, advising them of the various crucial skills needed to secure their position and improve them and importantly, to please their titled employers. This book shows just how astute Woolley was. She identified the back-of-house areas not generally covered solely in cookery books and produced one just specifically for that purpose. 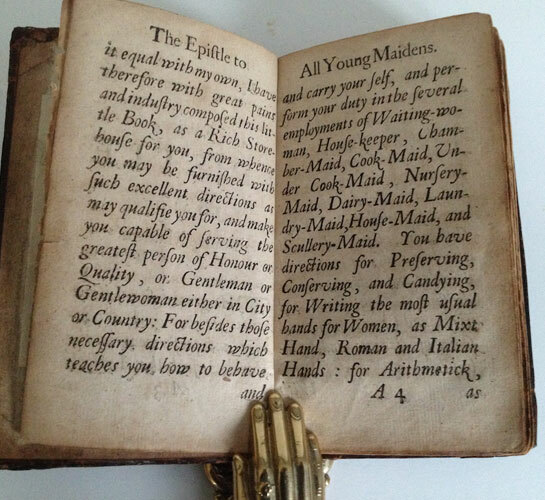 Oxford has a 1677 edition and comments on the usefulness of this little book. 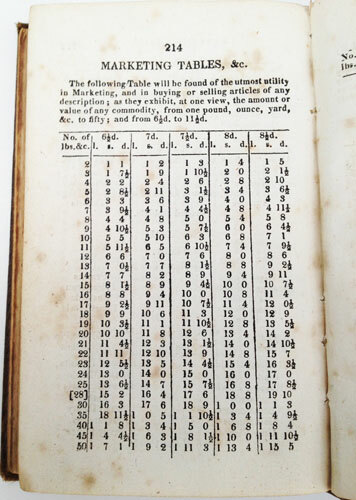 He informs of a 9th edition of 1729 with a supplement, but the plates removed. Hazlitt and Cagle have each a 5th edition of 1691. 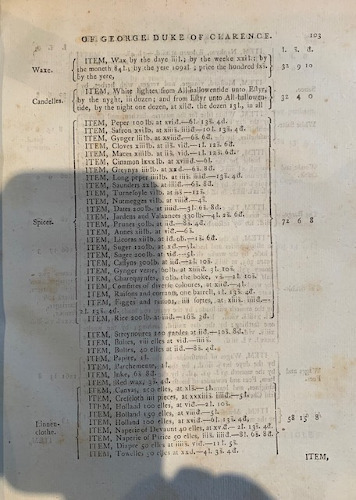 COPAC shows nine copies of the 1677 - 1st edition in UK holdings. 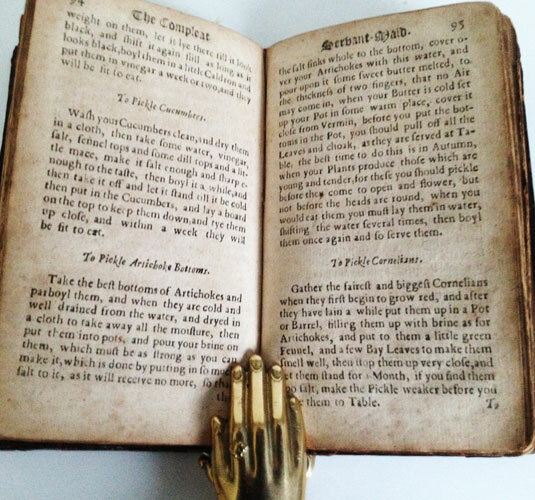 IN Preserving, Physick, Beautifying, and Cookery. CONTAINING 1. The ART of PRESERVING, and CANDYING Fruits and Flowers, and the making of all sorts of Conserves, Syrups, and Jellies. 11. 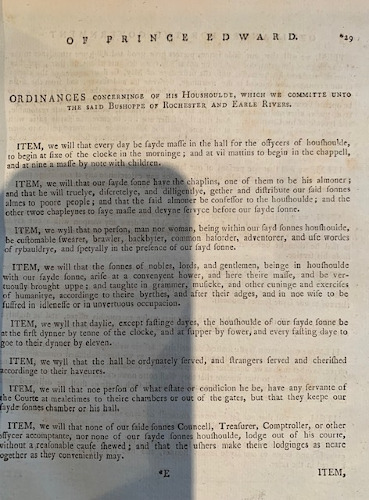 The PHYSICAL CABINET, Or Excellent Receipts in Physick and Chirurgery, Together with some Rare Beautifying Waters, to adorn and add loveliness to the Face and Body: And also some New and Excellent Secrets and Experiments in the ART of ANGLING. 111. 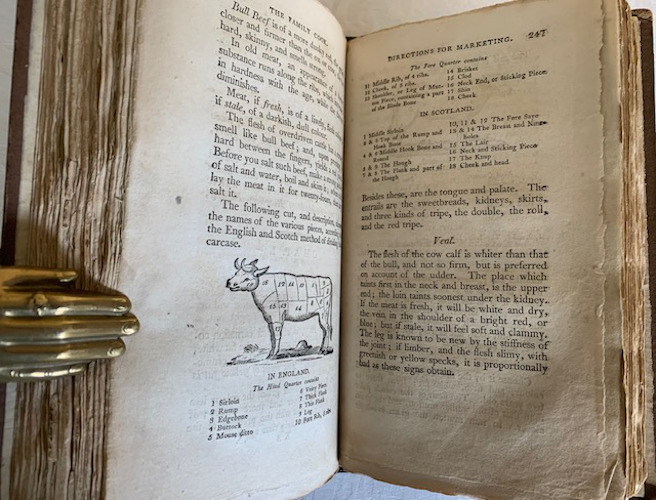 The Compleat COOKS GUIDE, Or, directions for dressing all sorts of Flesh, Fowl and Fish, both in the English and French Mode, with all Sauces and Sallets; and the making Pyes, Pasties, Tarts, and Custards, with the Forms and Shapes of many of them. The Fifth Edition Enlarged. LONDON, Printed for Benjamin Harris, at the Stationers Arms and Anchor, in the Piazza, at the Royal Exchange in Cornhill, 1685. 12mo. 2 modern fep . Engraved frontispiece of the author and engraved Title-page of four household scenes. 2nd Title page. 2 pages of Epistle Directory signed T.P. PART 1- The Art of Preserving 1-65. PART 2- Excellent Receipts in Physick and Chirurgery 66-105 with Frontispiece illustration of couple fishing (page 106). The Art of Angling. 107-126 with 1p illustration of fish, pages 115 & . 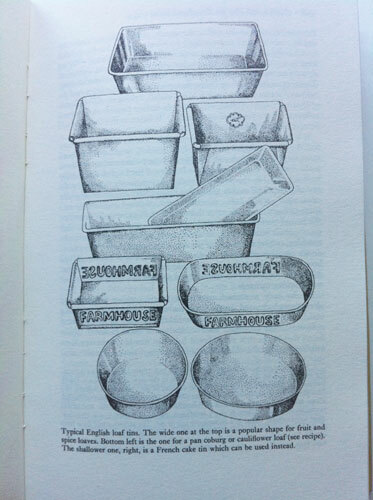 PART 3- The Complete Cooks Guide 127-196 with 2 pages of illustrations of Pye shapes. p197 - 199 Terms of Carving. p200 - 204 Bills of Fare. (1) To the Reader, signed BH. p206 - 208 A Great Feast, 12p of 'The Table'. 2 modern fep. Half tan calf with marbled boards and tan calf corners, Spine with gilt lines and 2 red labels with gilt lettering . The frontis, engraved title page and 2nd title page and 4 pages internally with expert repairs to the page edges. A very good copy with minimal aging. - There are doubts as to whether this really is the work of Hannah Wolley. See PPC #9 pp.66. Uta Schumacher-Voelker casts serious doubt on the authorship of this book and furthermore, presents some compelling points of research, that at least highlight the ambiguity, but unfortunately do not prove conclusively the case, for or against. From the library of Edward Gordon Craig we also learn that it is probably an unauthorised work based on Woolley's text. Certainly the ambiguous fact of two different initials in the same book, of one T.P. at the end of the Epistle Directory and the initials of B.H. on the un-numbered page next to p204 further hightens the confusion. It has been listed here under Wolley, as that is the name on one of the labels. If an answer is ever found and whatever it may be, it is none the less a rare book.